This is a new segment by the Habitat Podcast that focuses on the here and now. This new segment, titled “GAME PLAN” covers the most recent and helpful information from our guests DURING the hunting season, as it unfolds. We then put into the podcast format for our listeners to learn from, and then implement themselves right away if they choose. 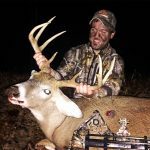 Today we chat with Jake Ehlinger, who harvested a great 140″ + Michigan Buck on October 4th. We are going to hear the story and we are diving into how exactly Jake did this, and why it worked!